Every parent is aware of the harmful apps and web content that exists on the internet. Unfortunately, many parents do not know how to adequately secure their devices for their children and those of us that do often struggle to keep up with the ever-changing internet. In our review, we discuss the unique features Family Zone have delivered to solve these problems and how their solution might be perfect for you. How can I manage my child’s screen time? What can I do to make sure my child’s internet access is safe? How can I ensure my child’s new phone is safe to use when they are away from home? Many solutions are already available however they tend to be either ineffective, easily bypassed or painfully over-restrictive (we’re looking at you Apple!). We have been closely tracking Australian based company Family Zone after we first became aware of their internet filter service. Our understanding of the technical aspects of their offering suggested they had something quite different from the rest of the pack so we contacted the Family Zone team who kindly sent us a trial box to review. 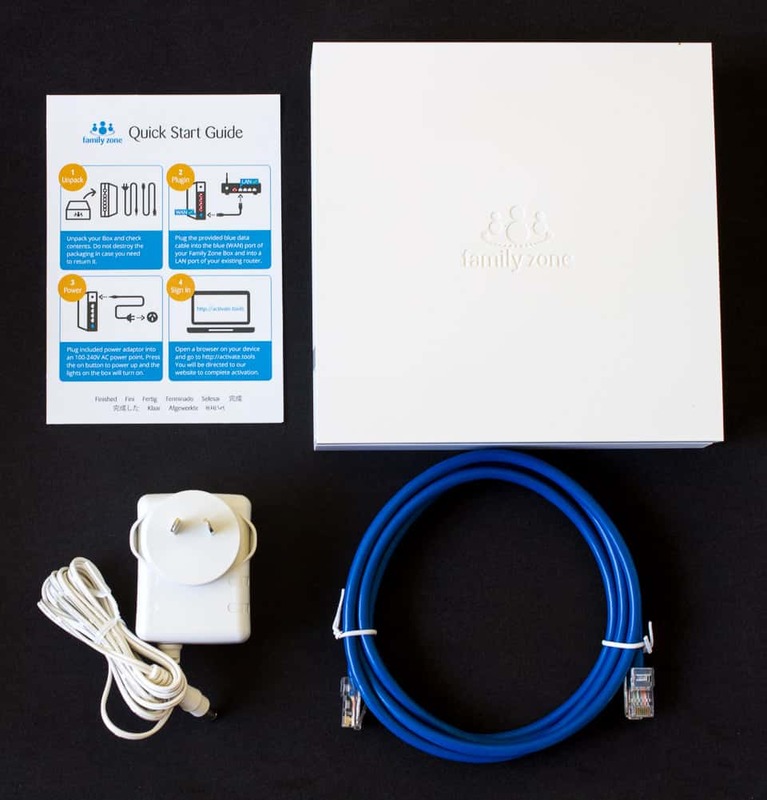 Family Zone tackles internet safety by way of an online service coupled with a box that manages your homes internet access. This review covers both the box and the online service, however, they can be used separately. The box ensures a more hardened, robust service than a pure software solution like NetNanny or Qustodio because, when set up correctly, users cannot bypass the device to access the internet. 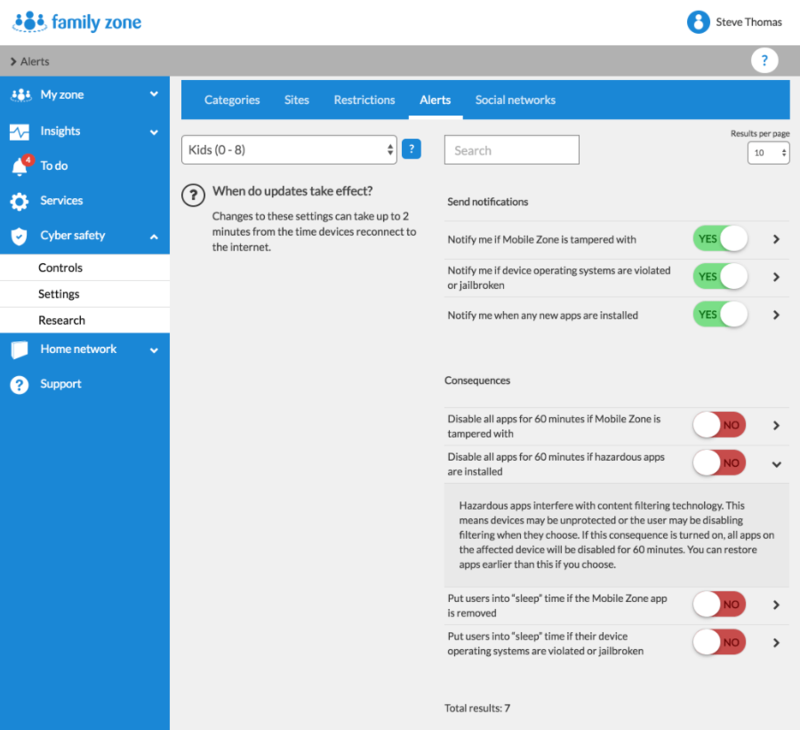 Family Zones online features set it apart from the parental controls available on Netgear routers that support Genie and/or Circle because they are more extensive and easier to use. *DISCLOSURE* We published this review and were so impressed by the product that we subsequently applied (and were accepted) as registered installers. What’s in the Family Zone box? The Family Zone box is essentially a Dual Band Wireless Access Point. This unit ships with four Gigabit Ethernet ports which we consider a must for any Wired Access Point. Oddly, some routers today still ship with slower Fast Ethernet ports so we were happy to see Family Zone not cut corners here. The box also has a power on/off button which is a feature commonly overlooked by cheaper routers. Unfortunately, there are no mounting slots available so the device can’t be mounted on a wall. This isn’t a deal-breaker for us but we hope it’s something that can be implemented in future. For technical specifications, see here. The box is easily setup by plugging it into your power mains and turning it on. Connect your existing modem to the WAN port using the included Ethernet cable. That’s it! Use your Family Zone user account and password to login. Follow the instructions to register your box. The guide suggests that you disable your existing WiFi network to improve the effectiveness of the internet filter. Their minimum recommendation is to change the password to your existing WiFi if you choose to leave it running. The presence of numerous wireless networks in your home (including those of your neighbours) will likely lead to intermittent poor WiFi performance for everyone. Consumer grade combination WiFi / Modems rarely handle both wireless traffic and internet traffic well. You can improve the performance of your existing Modem/Router by switching off its WiFi functionality. Some homes have very specific requirements for WiFi which may have already resulted in the purchase of a more expensive and feature rich WAP. It’s likely in these environments that users will want both devices to co-exist. If this sounds like your home, we recommend carefully considering how you implement an extra WiFi device like the FamilyZone to ensure both devices perform optimally. You can call us on 02 8502 8954 if you need help with this. This box has a Realtek RTL8198CD chipset that we haven’t seen before. We tested the performance of the chipset and found it performed well. The dual-band capabilities mean that your recently released smartphone will be able to use the faster 5 GHz band whilst providing a 2.4 GHz network for all your older devices. Our performance benchmarks of both Family Zone networks found it comparable to other similarly priced WAPs on the market. We would have liked to have seen beamforming. WAPs with this functionality can tangibly improve wireless performance for 802.11ac devices. We also would have liked to have seen Multi-User MIMO implemented. This relatively new technology improves wireless performance in homes where multiple wireless devices concurrently access the internet. This feature is typically available in modern, high-end WAPs. We hope to see it introduced in a future version of this unit. Click on the Home Network menu item to start creating your Wireless Networks. You’ll have the option of changing the WifI Network Name (SSID) and setting its own password (essential!). You can also choose a different SSID for your 5GHz network. You might find this useful for connecting devices to an SSID on a specific band. You’ll want to start creating members for everyone in your family after you’ve finished creating your Wireless Network(s). You’ll need to enter names and birth dates which Family Zone will use to determine the most appropriate profile. 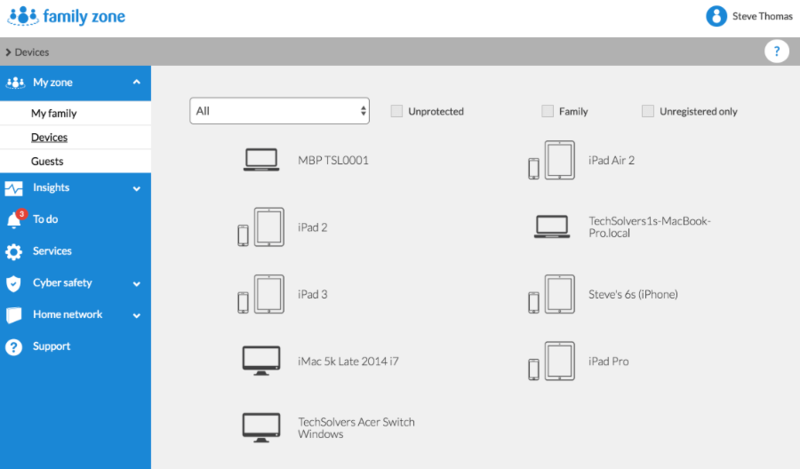 Family Zone populates new entries in the Devices screen when a device first connects to the network. You’ll then need to assign the device to a family member via the Family Zone portal (or Zone Manager). Family Zone can then filter/manage that device’s internet access as per the owners assigned profile. 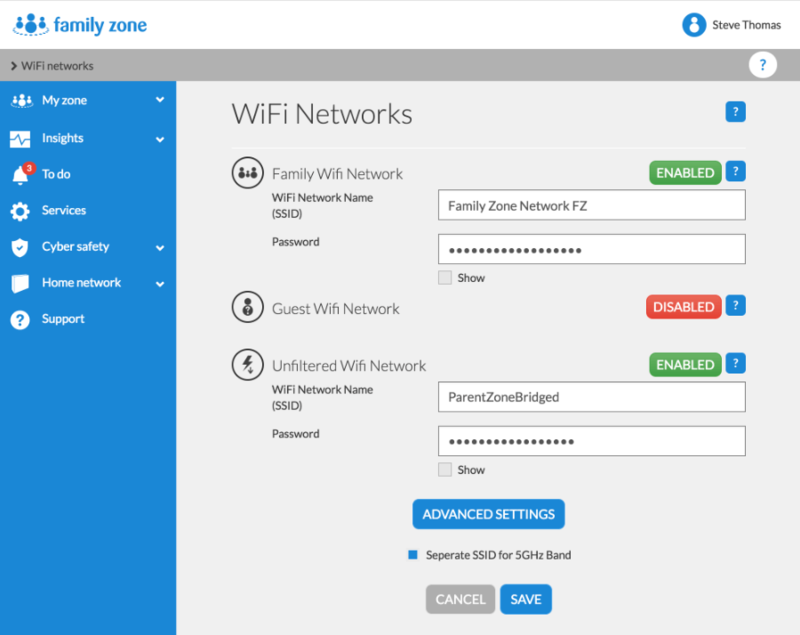 You’ll need to connect each device to the Family Zone Wireless network you created earlier to take advantage of Family Zones internet filtering. This means you can protect phones, tablets, computers, laptops, games consoles, SMART TVs or any other device that connects to the internet via a wireless or wired connection through the Family Zone box. Parents can connect their devices to a Parents Bridge network which is not filtered (make sure you protect this password!). Family Zone also supports the creation of a Guest network which means you won’t need to hand out your network password to visitors. The Family Zone internet content restrictions kick in after you’ve setup your family and their devices. 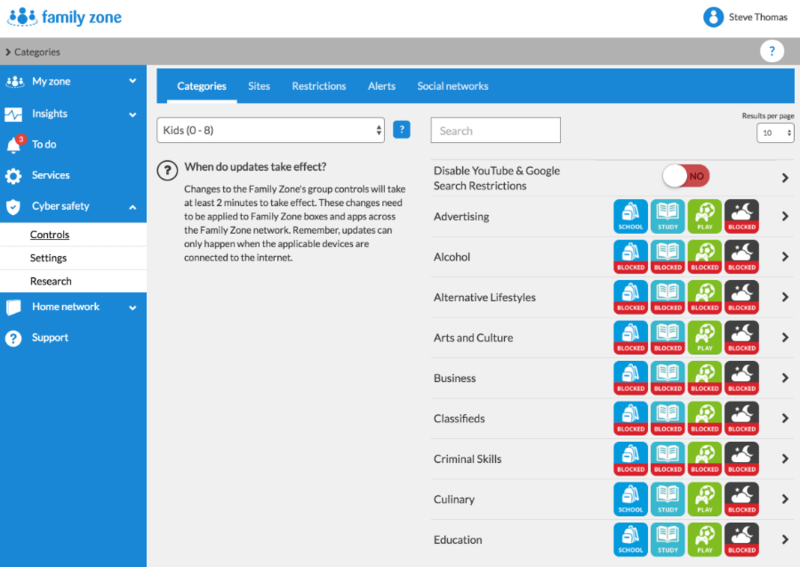 Family Zone categorizes websites based on their content. As an example, betfair.com belongs to “Gambling” which is a category that is banned for all profiles except Adult (21+). A child attempting to access a restricted site will see a Family Zone “Denied access” page. Clicking the “Ask my parents” button will send a request to your Family Zone account which you can then approve to grant your child access. We’ve seen this type of approval process implemented in other products with mixed success; either there are too many clicks or it’s just too slow. We found the Family Zone approval process was very simple. Approval emails were received promptly and requests appeared in Zone Manager almost immediately. Family Zone grants privileged access within seconds of approval which contributes to a very slick experience. Netflix obviously isn’t a parental control feature however many parents (us included!) consider it a necessity so any internet filter that impairs Netflix performance would be considered an abject failure. Thankfully, Netflix worked fine during our Family Zone testing which will be good news for many parents. Note: For content restrictions on Netflix (i.e. only allowing your children to watch children shows), you will need to use the Netflix parental control settings. Family Zone has four “Access Periods” – Sleep, School, Study, Play. These Access Periods determine when your child can access restricted features. Access Periods come pre-defined so you don’t need to set them up. You can also change them to better suit your needs. Example: during the Sleep period, you might disable all internet access. During the School period, you might disable internet access to all Social Media and Games categories. This is a very intuitive way of managing restricted access which works well. Unfortunately, there is no way to restrict access to apps & games that don’t require internet access. This means a child could still play Candy Crush at 1 am on a Family Zone protected device. 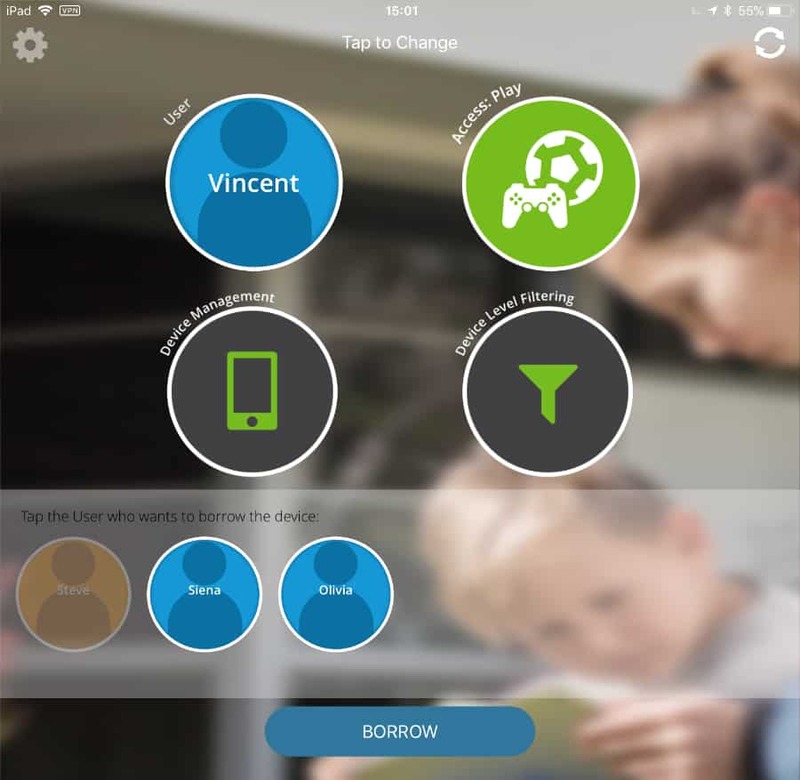 The Family Zone team have created the Mobile Zone app for installation onto your childrens iOS and Android smartphones / tablets to protect them while away from home. The app also gives your child information about their restrictions and allows the device to be “borrowed” to another user. A Mobile Zone subscription will protect up to six devices. Note: Apple users will need to be running iOS 8.0 or later whereas Android users need to be running Ice Cream Sandwich or later. Desktop versions of Mobile Zone are also available which delivers similar features for computers and laptops. This feature was released while we were writing this review. Our brief tests came back positive although we found Mobile Zone did not report on application installations (new or existing) like it’s mobile predecessor. Family Zone has told us this will be delivered in a future release. Note: Parents will need to ensure their childs Windows / Mac user profile on the computer does not have admin privileges. Family Zone provide clear instructions on how to do this for Windows and also on Mac. You can also contact our team if you need any help here. Most families share devices with each other. Family Zone allows family members to share devices by assigning a pin to each user. Simply change the user within Mobile Zone and use your pin to take control of the device. Parents will also find this useful for taking temporary ownership to install an app on a protected device. 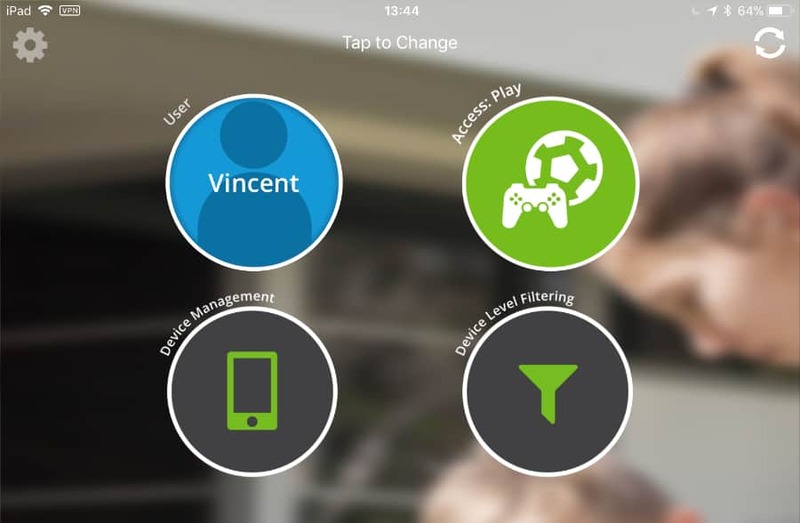 The Zone Manager App has been created specifically for parents devices so you can easily manage your childrens Family Zone experience using your smart phone. 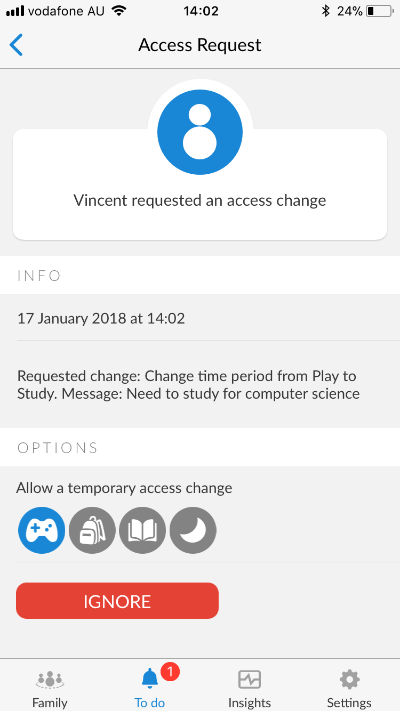 You can also use the app to review your child’s profile, review their internet usage or perhaps approve a request to change your child’s Access Period from Study to Play. Determined children spend a lot of time trying to bypass Family Zones restrictions. Thankfully, Family Zone will notify you of any bypass attempts and will also allow you to disable internet access automatically. Family Zone can also disable internet access after detecting a hazardous app installation. The Family Zone service emails a report every week detailing your children’s internet activity. 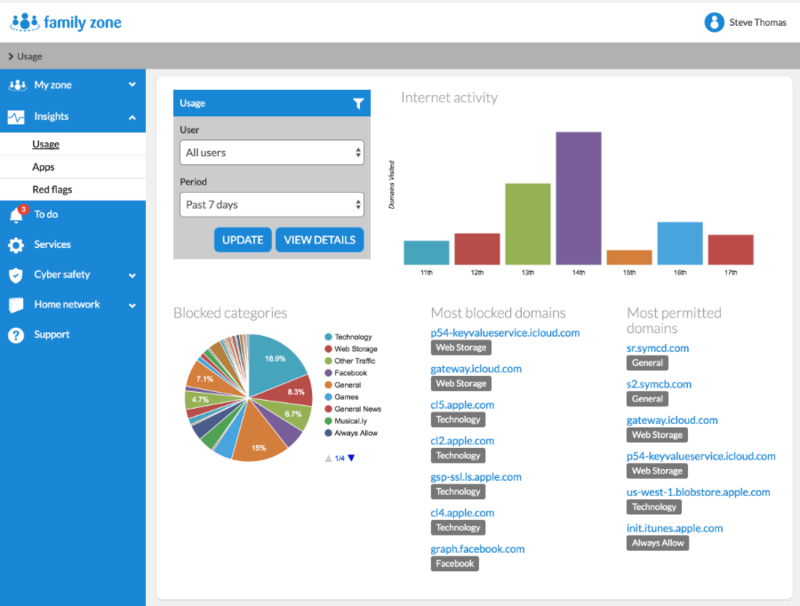 You’ll have visibility of blocked content, permitted content and new app installations. You can also use Insights within Zone Manager or the online portal for On-Demand access to your family internet usage. As well as metrics, you’ll be able to see which sites your family have been visiting and when. Family Zone emails parents a list of apps installed on a handheld device when Mobile Zone is first installed. This email helps parents understand what apps they need to be mindful of and why. Parents can then make an informed decision on whether to remove the app or not. This is a great feature that even the most tech-savvy parent will appreciate. Parents can also see a real-time review of all apps within the Family Zone portal at any time. Many parents are time poor and struggle to keep up with the ongoing demands of internet content restrictions. Family Zone allows you to have your children’s profiles managed by a Cyber Expert who specializes in this area. 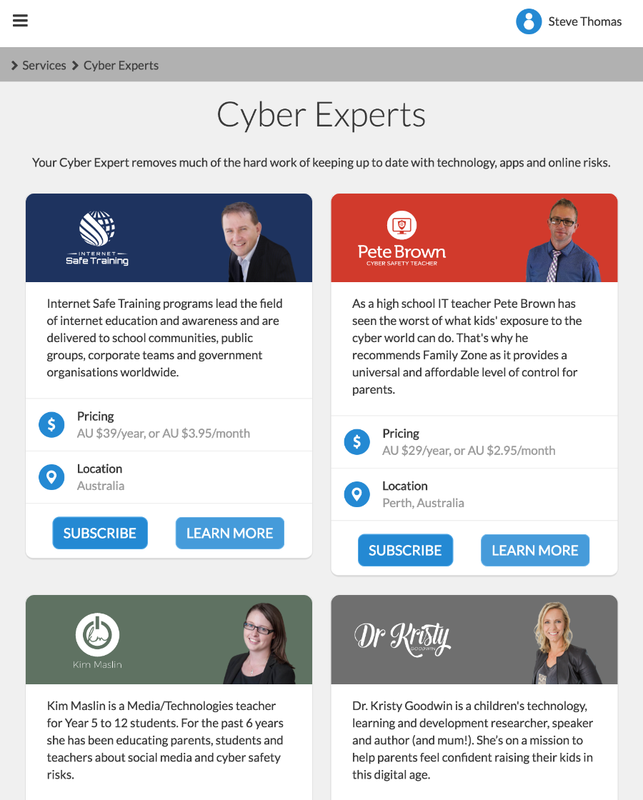 There are almost 20 different cyber experts to choose from with some resident in Australia and others in America. Subscriptions start from $2.95 per month / $29 per year which is a great price for such a value-added service. The inability to manage access to offline apps is worth considering before deciding to buy into Family Zone. This is of particular interest for parents of young children who don’t have internet access or who play mostly offline games/videos. We consider the rest of the limitations as minor. If you’re looking for a parental control service that can cover all your home devices as well as mobile devices, we have no reservations in recommending Family Zone. 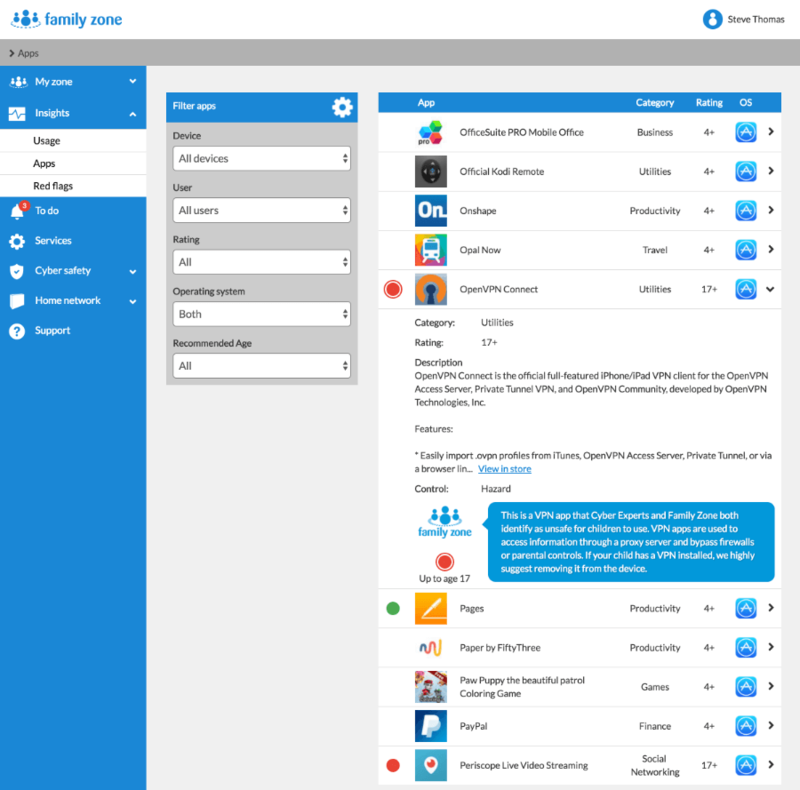 Family Zone offers more features than similar competitors, it’s quick and it’s been designed so that busy parents can effectively manage their children’s internet with confidence. The Family Zone box is priced competitively and its purchase can be easily justified based on its wireless capabilities alone. Furthermore, this box will likely fix those ADSL/WiFi combo Modems/ Routers requiring frequent restarts. One area where Family Zone excels over every parental control system we’ve seen is their ongoing promotion of internet safety. Family Zone is actively engaged with Australian schools and local experts in the field. As far as we know, there’s no other business out there doing this. Remember: No control is 100% foolproof. Us parents still need to be engaged in our children’s digital environment no matter what parental controls we implement. If you’d like further ideas on how you can manage your children’s screen time, check out iParent from the Office of the eSafety Commissioner. It’s a great resource for all parents and we recommend reviewing it periodically. You can sign up for Family Zone using our affiliate referral link..
Family Zone has a number of different plans available which they occasionally change so please check their website for the latest plans. Generally, the box sells for $89 with a trial Mobile Zone period and the Mobile Zone subscription costs $5.95 per month. 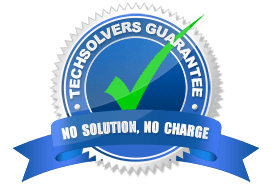 If you’d like TechSolvers to install and setup Family Zone for you, please submit a booking online or call us at 02-8502-8954.